ORDER OF WAR is a real-time strategy game set in the latter stages of the European theatre of World War II. Some gamers say that the World War II foundation has been over mined as a game premise and environment and while I might tend to agree, I certainly remain open to something new and fresh that a developer can bring to the genre. In the case of developer's, Wargaming.net, and publisher's, Square Enix, ORDER OF WAR might just be that "something fresh.". No ORDER OF WAR is not another FPS (first person shooter) set somewhere in Europe, but a real-time strategy (RTS) game that takes a step beyond even in terms of that sub-genre. Interestingly, in ORDER OF WAR, the player is allowed to participate in the final thrusts of the European theatre on both fronts; controlling the Allied Advance or Germany's defense against the Russian counter-offensive in the East. Here we get much more than a few squads or divisions to control, but entire armies! ORDER OF WAR also allows the player to control just how these epic battles are viewed; allowing the game to become much more "cinematic" in experience than any other WWII strategy game. Given the scope and breadth of this game, the developers made an epic choice in bringing on veteran game score composer, JEREMY SOULE. Composer JEREMY SOULE is no stranger to scoring video game titles requiring both dramatic depth and fast-faced action music; his best known works to date being from game franchises such as GUILD WARS, ELDER SCROLLS, WARHAMMER and HARRY POTTER. Soule has clearly proven his hand at capturing the sci-fi/fantasy sub-genre, but what about the more realistic realm of World War II? ORDER OF WAR is, in fact, not his first foray into these battlefields. With his 2006 work for the well received title, COMPANY OF HEROES, Soule proved that he could equally handle a real time strategy game set in the European theatre. Since it's release, Soule's original score for the game has been praised as highly as the game itself. And it is this score that ORDER OF WAR most closely compares to. 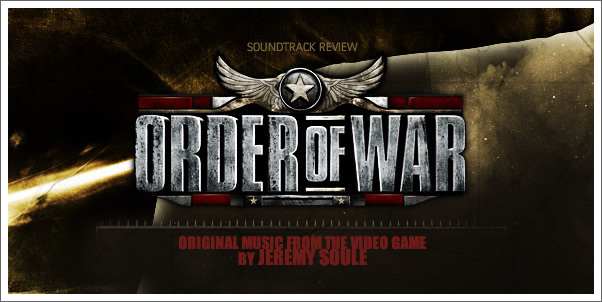 While there have been recent attempts at putting a new musical spin on World War II shooters, JEREMY SOULE keeps to the more familiar palette used for this historic subject matter whether it be for a game, television documentary, or feature film. In ORDER OF WAR, we are treated to a powerful entrée of epic, orchestral engagements that occasionally bring to mind some of Hollywood's best-ever composers. No. ORDER OF WAR doesn't necessarily offer anything "new," but it does manage to return to that idealized sound associated with this world war. And somehow, while sticking to conventions, JEREMY SOULE is able to keep his score fresh and avoids becoming a second-rate, knock-off of some of the better known WWII games of recent years.